On June 8, IBA Group celebrated opening of a new research & production cluster. The event was attended by Minister of Tax Collection of the Republic of Belarus Sergey Nalivaiko, Director of Belarus Hi-Tech Park Valery Tsepkalo, Chairman of IBA Group Sergei Levteev, city administration officials, top managers of the leading Belarusian enterprises and foreign guests – IBA Group vendors and customers. The opening ceremony began with the appearance of a "visitor from the future" – from the distant 2041. The mysterious visitor in a futuristic suit represents the future which begins for IBA Group with the opening of the new cluster. 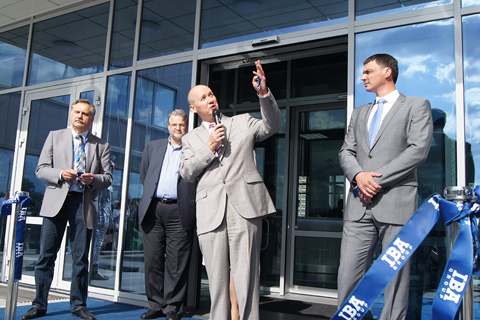 High-ranking guests congratulated IBA Group on the important achievement and took part in the ribbon cutting ceremony. Minister Sergey Nalivaiko noted that the Ministry of Tax Collection cooperates with IBA Group since 2005: "The company is committed to customer-oriented approach and considers customer interests not just by words but in practice which is the key to success." HTP Director Valery Tsepkalo congratulated employees of IBA Group. 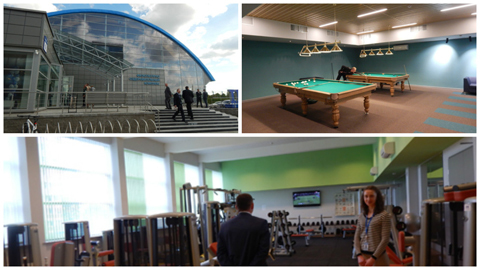 He revealed how the cluster was created and emphasized that the concept of "working, living, resting and doing sport in one place" implemented by IBA Group is common for Belarus Hi-Tech Park in general. After the opening ceremony, the guests were invited to walk around the cluster. a three-level parking lot and an outdoor parking lot for over 400 cars. IBA Group Chairman Sergei Levteev disclosed that when designing the cluster, IBA experts took into account concepts of the best offices in London, Milan, Prague and other cities where the most advanced technology had already been tested. "We invested about USD 40 million in the construction of the cluster. There are no IT companies in the country to have such a complex. The working conditions here meet international standards. We are able to implement the highest demands of our customers when organizing projects and project teams."